Oh your blanket is amazing! Hope mine will become that big and lovely one day. Excellent work! I just love that there’s a spreadsheet! Makes me chuckle every time I think about it! BeaUtiful work Maureen….you are an inspiration! Your blanket is amazing! Okay, now I understand why you have a spreadsheet. Good luck! 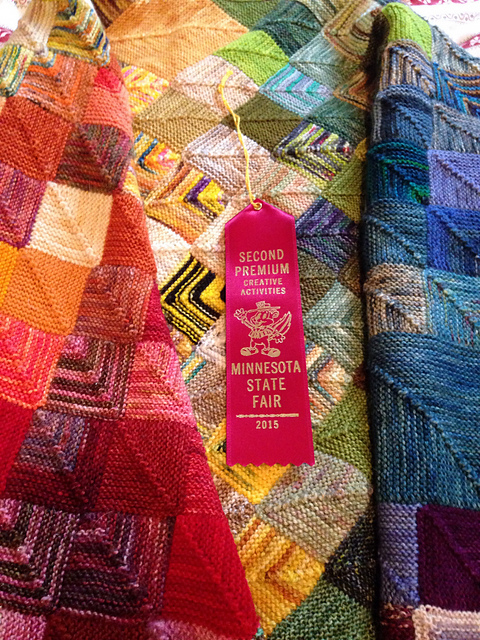 Your knitting is amazing, and definitely up to State Fair level. The square-is-not-a-rectangle blanket/shawl is gorgeous. Sorry about the late reply, your comment got lost in the shuffle! Thank you! I hope that once it’s in the right category it’ll do well for itself.